Minister of State for the Diaspora and Overseas Development, Ciaran Cannon, TD, at Iveagh House with Irish Aid Fellows for the 2018 Fellowship Seminar Day. 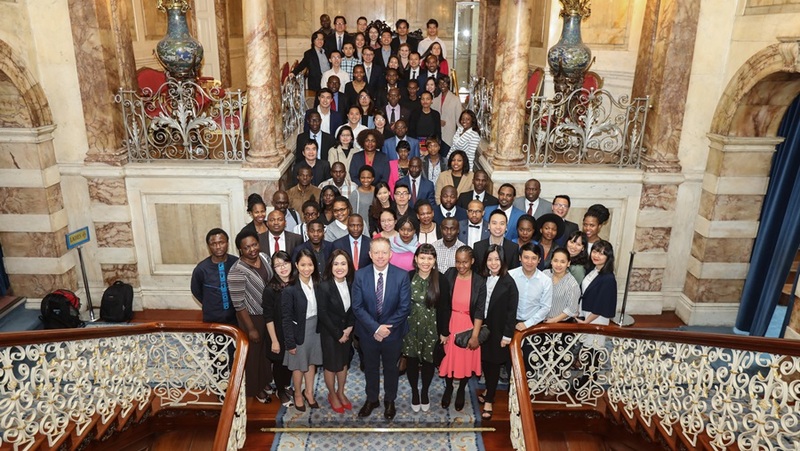 On Monday April 16, Minister of State for the Diaspora and Overseas Development, Ciaran Cannon, Irish Aid Africa Director, Fionnuala Gilsenan, and Deputy Director and Head of Fellowships, Ciara de Mora, welcomed this year’s fellows to the 2018 Fellowship Seminar Day at Iveagh House, the headquarters of the Department of Foreign Affairs and Trade in Dublin. Addressing fellows, Minister Cannon spoke of the 44-year history of the fellowships programmes and the importance of education in any country's development experience. The full text of his speech is available below. Following his speech, Minister Cannon engaged with fellows through a question and answer session. Four of this year's fellows also made presentations speaking about their research and their experiences while studying in Ireland. Our four speakers were Nyasha Sanie (Zimbabwe), Siyabonga Reginald Mathebula (South Africa), Khaing Min Thant (Myanmar) and Nguyen Thi Quynh Trang (Vietnam). This was the last event at which all of the 2017/18 fellows will be together with the fellowships team at Irish Aid and ICOS. We wish all 2017/18 fellows the best of luck in their exams and dissertations in the weeks ahead, and look forward to maintaining connections into the future after they return to their home countries in the coming months. Welcome to the seat of Irish diplomacy: Iveagh House. Before it became our headquarters it was the Dublin home of the Guinness family whose fruit you may have enjoyed here or in your home countries. Guinness remains one of our main exports across the world, notably to Nigeria, and those of you from South Africa will know it from its sponsorship of so many offerings on the Sports Channel. We’re here today to celebrate your time in Ireland and your success as Irish Aid fellows. I am looking forward to hearing four different perspectives from amongst you on what it’s like to study public health, climate change and agriculture, environmental management and project management. I am disappointed, however, that only one of the speakers is from Galway. Next year I expect all four speakers to come from my County. The Fellowships programme is in its 44th year. Over the years it has adapted to changing needs and priorities. The programme symbolises that education is at the heart of any country’s development experience. It is only fifty years since free secondary education was introduced in Ireland. Since then we have changed from a nation that exported its young, unformed and ill-prepared, to a country which has one of the highest levels of third level education in Europe. A country which is able to offer its citizens a higher standard of living than their grandparents could have ever imagined. Let me tell you about my family. My father’s generation were lucky to finish primary school. My generation benefitted from free secondary education and I was fortunate to go to university. My son’s generation expects to go to university. Over that time, as my family moved up the education ladder, we moved up the economic value chain from what many would term subsistence farming to the opportunity to become a Minister in government. This experience and the accompanying transformation of our island explains why we value education so highly. This is why we place it at the heart of our development policy. In recognising the value of education and its potential to catalyse development it is, I think, important that we acknowledge that every country and every society has their own needs and that these needs change over time. That is why we strive to find new ways to improve the fellowships programme. In recent years this has been through taking inspiration from the Irish who left their mark on the world or those on whom Ireland left a mark. Those of you from South Africa who are here on Kadar Asmal fellowships will know that he was a Minister in Nelson Mandela’s government and helped draft your Constitution. Indeed, when I was in South Africa last year, I discussed with my South African counterpart our memories of Kadar and how one of the first drafts of that Constitution was written in his home here in Dublin with Abie Sachs giving his able assistance. As Minister for Education, he instituted South Africa’s most wide ranging reforms. His link with Ireland was strong: he taught Law at Trinity College for 27 years and founded the Irish Anti-Apartheid Movement. I hope you will take inspiration from his achievements but also from his values. In 2017, another fellowship was created to honour the memory of Roger Casement an important figure in Irish history. Casement was executed in 1916 for his role in the Easter Rising. His early career was as a British diplomat, serving in Nigeria, Mozambique, Angola, Congo and Brazil. He was a pioneer in advocating for human rights. He told truth to power and changed the course of Congolese history through his report into abuses on rubber plantations. He took a modern approach, travelling to affected areas and interviewing witnesses, using their words to describe the appalling conditions he found there and, with E.D. Morell, in a hotel about a hundred miles from here, he developed the beginnings of the modern vocabulary of Human Rights. It was Casement’s experience in colonial Africa which caused him to re-examine injustices in Ireland which led him to reject British rule. In the process he became one of the first liberation leaders of the 20th century and inspired similar movements in Africa and India. With his humanitarian legacy in mind, we offer a fellowship for a Human Rights course to a student from Nigeria. I am pleased to welcome Aliyu Usman, the first recipient of that award here today. I hope you find these stories as inspiring as I do and that, in years to come, my successors will stand here telling new students about your achievements. It is your commitment to education, progress and strengthening your country that has brought you here to study at Irish institutions. You represent our determination to create a fairer, more just and sustainable world. As fellows it is your ideas, your creativity and your leadership that will help shape the future of your respective countries. The success of the Irish Aid Fellowships programmes will be measured by the extent to which you can contribute to the future economic growth and wellbeing of your societies. Over two thousand scholarships have been awarded through the Fellowships programme since 1974. I hope you have built ties with Ireland, its culture and its people while studying here. These are bonds I would like to see strengthened between Ireland and each of your countries. Drawing on what I hope is a positive experience here in Ireland I trust you will find the Irish Embassy in your country a resource to you and choose to join our alumni network. I will finish by wishing you the very best of luck in your examinations and remaining course work and I look forward to hearing your impressions of the programme. Thank you all for coming today.